This Quick Start automatically deploys an IBM Blockchain Platform (IBP) distributed peer into the AWS Cloud in 10-15 minutes. A blockchain is a growing list of records, or blocks, that are linked and secured by using cryptography. It can be used as a distributed ledger. Peers, a key component of blockchain networks, maintain a copy of the ledger, endorse transactions, and host smart contracts. By using the IBP for AWS, you can deploy peers on AWS and can store ledger data in your AWS environment. The IBP distributed peers in AWS leverage the connection profile, Hyperledger Fabric certificate authorities (CAs), and the ordering service of an existing Enterprise Plan or Starter Plan network on IBM Blockchain Platform to process transactions. This Quick Start is for IT infrastructure decision makers and system administrators who want to rapidly configure, deploy, and run AWS-hosted IBP distributed peers that are connected to an IBM Blockchain Platform network. This Quick Start was developed by IBM in collaboration with AWS. IBM is an APN Partner. 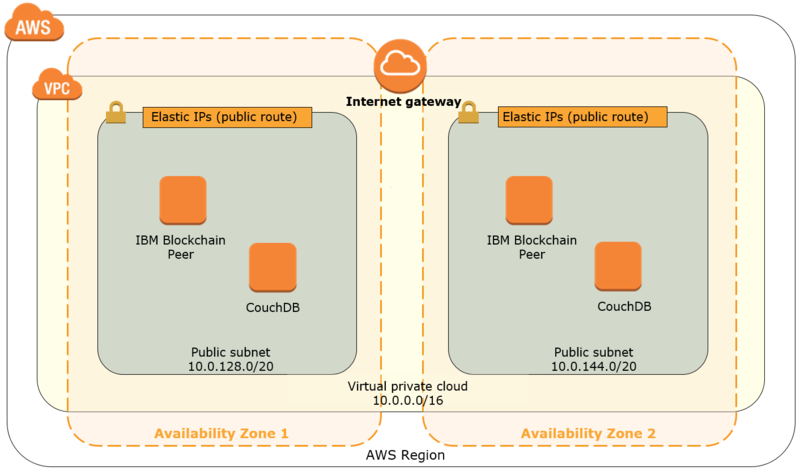 In the public subnets, an IBP for AWS cluster, which includes two peers across two Availability Zones (one peer in each subnet). In each public subnet, a peer container with either an embedded LevelDB database or a secondary CouchDB container. Register your distributed peer identity and retrieve your distributed peer configuration information. Configure the IBP for AWS distributed peer. This Quick Start deploys the IBP for AWS environment using AWS CloudFormation templates. You can use the template to build a new virtual private cloud (VPC) for your IBP for AWS cluster, or deploy the IBP for AWS cluster into an existing VPC. At this time, you must accept the license agreement to use IBP for AWS to be able to use the solution that is deployed by the Quick Start. The IBP for AWS software license agreement contains more details about licensing terms. When you launch the Quick Start, you’ll be asked to read and agree to the terms of the agreement. IBP for AWS is currently offered as a Community Edition, free of charge. IBM Blockchain Platform does not provide support for this offering. If you encounter any issues that are related to your distributed peer, refer to the free blockchain resources and support forums.